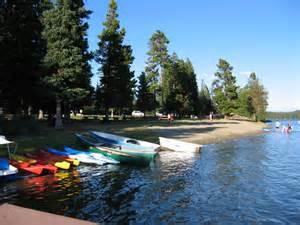 Lac Le Jeune Provincial Park is located about 1/2 an hour south of Kamloops and a bit over a 1/2 hr north of Merrit, just off Highway 5. The elevation, of almost 1,300 meters, can be both an attraction and deterrent when considering this park. Residents of Kamloops and Merrit flock here is the summer to get away from their often extreme desert-like temperature. You will find Lac Le Juen is on average about 10 degrees cooler than either of those cities. This park also has a nice beach and swimming lake although it can be very cold early in the season. 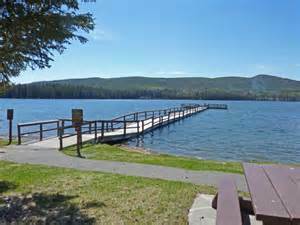 The area is popular for fishing and there are also a couple of other good fishing lakes nearby. It is surprising that you are only 1/2 hour away from the city but once in the park you feel like you truly are getting away.Once thing to keep in mind about this park is it recently underwent a reforestation project which took out many of the large trees. For this reason you will need to take care in picking your sites if you are looking for shade and privacy. They have done a great job replanting but it takes time for new trees to fill out and give the same forest feel that Lac La Jeune once offered. Due to its remote location, the campground still feels private and forest-like but once into the park and looking at campsites you can easily notice the reforestation impact. 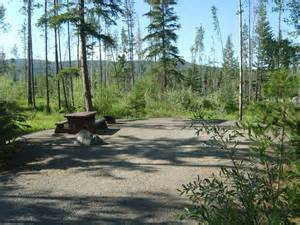 Recommended Sites: Site selection is important in this campground. As mentioned it has recently had some reforestation so the privacy of the sites change from season to season. 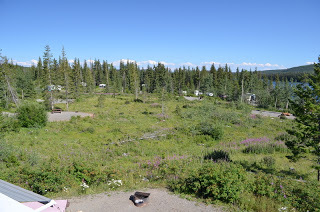 It use to be that the camp sites on Whisky Jack Lane were preferred but now many tend to lack privacy and wind shelter. When booking, take the time to review the photos available on the web site. As you move up to Waxwing Lane the trees start to provide more privacy; you do give up being closer to the lake but for the sake of privacy it is worth it. This campground has a lot of first-come-first-serve sites so it is worth heading to if you can’t get a reservation elsewhere. The photo here gives an idea of how the trees have been thinned and the one below gives a view of the open feeling now within the park. Good elevations giving you cooler temperatures, this can be good and bad. Pit toilets throughout the park. Hiking and biking on park trails. ← No Electricty, No Problem!